Experience the breathtaking views of Ventura County and beyond- all in one charming, historic building. 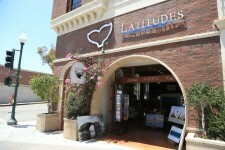 Located in the heart of Ventura’s Downtown District, Latitudes Fine Art showcases the exquisite and captivating imagery from local photographers; Stephanie Hogue and Steve Munch. Step behind the lens and into the moments that take your breath away.Celebrate your community or extend your vacation bliss by taking home a piece of your very own. Images available in every shape, size and material. “Find Yours,”- today.